D-Link has announced UK specific details of its Boxee Box, the set-top gizmo which brings web content to your TV. The unit has a UK release date of mid-November, with pre-ordering from the likes of Amazon beginning soon, and will cost £199. Based around the Intel Atom CE4100 chip – which will also be powering Google TV – the Boxee Box offers up a host of web content which has been optimised for TV viewing. There will be a number of apps available for the box at launch. These include: BBC, Last.fm, CNET, CNN, Channel 4, Comedy Central, Facebook, ITV, MTV Music, mySpaceTV, YouTube, Flickr, and Picasa. 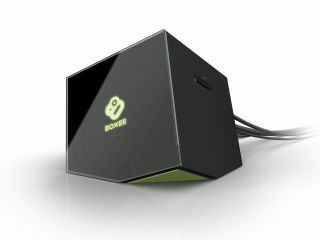 Details of the box were revealed at IDF, the Intel Developer Forum, where it was explained that the Intel-based hardware will allows Boxee's open software platform to deliver up to full 1080p HD over a wired or wireless connection. The box has already garnered a lot of attention since its debut at CES 2010. But that was nine months ago, so it's nice to see the box rearing its head again, especially as Project Canvas looks to be no closer to being released in the UK. As well as being a portal to the web, it will also act as a media streamer and is compatible with most formats, including Flash, MP3 and DivX. Connectivity wise, D-Link's machine has one HDMI port, optical / stereo audio, Wi-Fi, 2 USB ports, 1 SD card slot and a two-sided remote with a full QWERTY keyboard.